The Southeast is a vibrant region in the United States, with each state showing off its own unique personality and culture. As a visitor, you can explore the food and fashion of Charleston, South Carolina; the history of Alexandria, Virginia; the southern hospitality and arts in Savannah, Georgia, and plenty of other great cities and communities across the region year-round. Come springtime, though, locals and tourists flock down south to take in the food, culture, music, and arts festivals, and these annual March events are not to be missed. From Saint Patrick's Day events across the country to the Virginia Festival of Books, be sure to check out some of these great events coming to the southeastern United States this spring. St. Patrick's Day may not be celebrated as much in the southeastern United States as it is in Boston or Chicago, but there are still plenty of parties to be found on and around March 17 including local parades, festivals, and bar crawls. However, the one standout city in the southeast is Savannah, which hosts the nation's second largest St. Patrick's Day celebration. The Savannah St. Patrick's Day festivities come complete with parades, live music, and feasts, and some people have even likened the festivities to Mardi Gras in New Orleans due to the size and scale of the celebration. 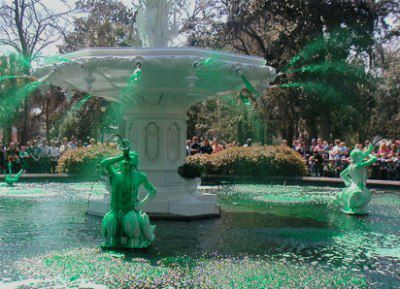 Popular highlights of the Savannah St. Patrick's Day event includes the Greening of the Fountain in Forsyth Park, the Tara Feis Irish Celebration, and the annual parade. The Atlanta Journal-Constitution International Auto Show is an annual celebration of classic, exotic, muscle, domestic, and imported automobiles that takes place toward the end of March in downtown Atlanta. This exciting auto show features an array of imported and domestic cars, light trucks, vans, and sports utility vehicles, many of which have been customized and "souped up" to make them slick and speedy. The next annual event will take place on March 20 to 24, 2019, in downtown Atlanta and will feature a GM Futureliner, an invention from the 1930s that looks like a combination of a semi truck and a school bus. Myrtle Beach welcomes Canadians and other visitors on spring break during their annual CanAm: Canadian-American Days celebration, which will take place over two weeks from March 9 to 17, 2019. The CanAm festival includes sporting events, concerts, historical tours and more at various venues along the Grand Strand of South Carolina's coastline. Other events for the CanAm Days festival include a Broadway at the Beach KidzTime Festival, the Myrtle Beach Marathon, a "Marshi Gras" celebration, the "Run to the Sun" Car Show, a beachside Jeep rally, and the annual St. Patrick's day parade and festival. This time-honored South Carolina traditiona attracts over 65,000 fans a year to enjoy an afternoon of steeplechase horse racing, elaborate tailgate parties, and more in Camden, South Carolina. Although not as well-known as the Kentucky Derby, the annual Carolina Cup is a great way to introduce your family to horse racing or simply to enjoy the day with your adult friends. Here, tailgating is just as much part of the event as the race itself, so be sure to book your tent or spot in advance so you can get the best views of the race from the comfort of your own private setup. Held under the tents in Marion Square, the five-night Charleston Fashion Week features more than 40 runway shows, the Spring Bridal Show, Emerging Designer Competition: East, and Rock the Runway Model Competition. Accredited with launching the careers of numerous up-and-coming designers, this multimedia event presents high-end runway shows, interactive entertainment, chic after-parties, and press events throughout the week. Unfortunately, most runway shows require tickets to attend, but many events have general guest admission, including the afterparties, if you RSVP in advance. Charleston Fashion Week kicks off on March 22, 2019. The Charleston Antiques Show is a premier destination for antique collectors and admirers alike. This renowned show features over 30 of the nation's most prominent antiques dealers and includes an array of period furnishings and decorative arts, vintage jewelry, porcelains, ceramics, silver, and architectural garden accents. This annual event usually takes place in mid-March (March 15 to 17, 2019), and brings together collections of English, European, and American period furnishings, arts, and jewelery—mostly from the 17th to 20th centuries. Tickets are required to attend, but can be purchased on the official Historic Charleston Foundation website. Held at the Georgia International Horse Park, the Conyers Cherry Blossom Festival features local and international music and dance, over 300 arts and crafts vendor booths, food, games and ongoing entertainment for all ages. Although not nearly as big as the Cherry Blossom festivals in Washington, D.C. or Brooklyn, New York, the Conyers festival is also geared toward educating visitors about Japanese culture through internatonal collaboration. This year's event will include multiple food courts, culture performances, live music, and a children's area along with hundres of unique art and craft exhibitors and will take place on the weeked of March 23, 2019. The Festival of Flowers takes place at the Providence Hospital Campus in Mobile, Alabama, over four days in late March each year. This horticultural extravaganza features landscaped garden displays, tablescape creations, and also includes an art competition, a full market of seasonal flowers, garden dining, and kids' activities including immersive educational classes about gardening. The 26th Annual Festival of Flowers will be held on March 21 to 24, 2019, and will celebrate Dutch gardens through a variety of unique displays, exhibits, and landscape designs. Tickets can be purchased on the Providence Hospital Foundation's Festival of Flowers website. The Festival of Houses and Gardens in Charleston is one of the best ways to get an intimate view of this decadent southern city. As part of the month-long festival, each house and garden tour allows visitors to explore several properties that date back to the founding of the United States. Buildings on the tours date back as early as the American colonial period but also include the antebellum and Victorian years of architecture as well as several early 20th-century designs. Tickets are required for all tours but can be booked on the Festival of Houses and Gardens website. Guests will be able to explore various colonial and antebellum neighborhoods during Charleston's peak blooming season, which takes place throughout the month of March. If the gardens in Charleston aren't enough, the annual Savannah Tour of Homes and Gardens offers visitors the chance to tour private homes and gardens in a variety of different Savannah neighborhoods all month long. Each day of the tour, a new neighborhood is featured for three hours, during which visitors may enjoy self-guided tours in any order at a comfortable individual pace. While not as big as its Charleston counterpart, you'll still want to book tickets early as tour groups fill up fast, especially during spring break. Spring in the southeast is a great time to take in nature, especially in garden cities like Charleson, Savannah, and Pine Mountain, Georgia, which hosts spring celebrations at Callaway Gardens every week from late March through April. Each of the annual Spring Celebration weeks (March 22 through April 28, 2019) features activities for enjoying the natural beauty and breathtaking spring blossoms at Callaway Gardens in Pine Mountain, Georgia. Hands-on activities, educational experiences, guided hikes and much more offer spring fun at its best for all ages. If you're a fan of wine and seafood, you can head to the lovely Hilton Head Island in South Carolina for the annual Island Wine and Food Festival, which offers events that feature coastal culinary treasures and the bounty of local vineyards. The main draw of the festival is WineFest, one of the largest outdoor public wine tasting events on the East Coast, but you can also attend the Grand Wine Tasting and Auction, which offers some of the best selections of wines from the region and around the world. The International Cherry Blossom Festival is held when Macon's 300,000 Yoshino cherry trees are in bloom, which usually happens during the last two weeks of March. During this annual Georgia festival, you'll find everything from parades, home tours, and firework displays to nightly concerts, arts and crafting events, amusement rides, and a dazzling Hot Air Balloon Festival that includes a twilight Balloon Glow. Formerly known as the Cine Noir Festival of Black Film, the North Carolina Black Film Festival is a four-day event that takes places in Wilmington, North Carolina, each March. Showcasing the works of an array of filmmakers, this annual events spotlights features, shorts, documentaries, and animation by and about African Americans. The 16th Annual North Carolina Black Film Festival will take place from March 21 to 24, 2019, and will feature an evening of student shorts at Jengo's Playhouse, a family movie day at the Cape Fear Community College Union Station, and a celebration of music in film at Kenan Auditorium. The Palmetto Sportsmen's Classic is an exhibition of all things outdoors that place at the South Carolina State Fairgrounds in Columbia each year. Featuring more than 300 exhibitors, this annual hunting, fishing, and outdoors show includes family-oriented displays and activities that sportsmen of all ages can enjoy. Other attractions at this annual event include Nature Nick's Animal Adventures, a fast-paced wildlife show that includes a 10-foot python and a Eurasian Eagle owl; Jim Vitaro's Hawg Trough, a 5,000-gallon mobile fish tank; and special appearances by celebrity fishermen and hunters. If you're a fan of driving and yard sales, there's no better place to do it than the annual Peaches to the Beaches Yard Sale, which takes place along U.S. Highway 341 from Barnesville and Culloden to Brunswick and the Golden Islands on Georgia's coast. This more than 200-mile yard sale is planned for the weekend of March 22 through 24, 2019, and features collections of residents across the state who set up at booths along the highway for the duration of the weekend. While the event changes from year to year, you can always anticipate a variety of treasures among the various sales. However, you'll want to be sure to book a hotel along the highway if you plan to spend some time shopping over the weekend. Also be sure to bring plenty of cash since most vendors won't take credit cards and not all will accept online payment methods like Paypal or Venmo. One of the largest music festivals in the Southeast is the Savannah Music Festival, an annual musical marathon that showcases a wide variety of music. Not only will you find music from the Deep South, you'll also find internationally renowned musicians performing a diverse range of musical styles including symphonic music, blues, jazz, gospel, chamber music, bluegrass, rock, world, and electronic dance music. It will be held from March 28 to April 13, 2019. The largest gathering of authors, writers, and readers in the Commonwealth, Virginia Festival of the Book takes place in Charlottesville, Viriginia at the end of March each year; in 2019, it will be held from March 20 to 24. This annual celebration of books, reading, literacy, and literary culture includes traditional author readings and book signings, panels, discussions, and workshops for budding authors. From special Easter services to Easter family fun like egg hunts, special events, and resorts offering an array of weekend activities, the Southeast U.S. offers a basketful of choices for a day trip, weekend getaway, or spring break vacation this Easter. One favorite event is the Easter Eggstravaganza brunch and egg hunt for the children at Middleton Place, a historic plantation outside Charleston. If you're looking for an Easter Event that takes place in March, there are plenty of places to enjoy it—if Easter happens this month. Unfortunately, in 2019, you'll have to wait until April 21 to celebrate this holiday. Experience IMAX on Your Trip to the Southeast U.S.
November Festivals and Events in the Southeast U.S.